Sarnath or Saranganath is one of the most important Buddhist pilgrimage centres in India. It is situated about 13 kms to the North East of Varanasi in the Indian state of Uttar Pradesh. It was also earlier called Mrigadava, Mrigadaya, Rishipattana and Isipatana. In the ancient Buddhist literature it was referred to as Rishipattana as after attaining Nirvana many Pratyeka Buddhas or Rishis came to this place. It was called Mrigadava or Mrigadaya or deer park and the legend can be found in the Jataka tales. In one of them the Buddha as Bodhisattva had been a leader of a herd of deer. The local king began indiscriminately hunting down the deer with the result that the Boddhisattva made a pact with him that the King would refrain from killing and everyday one deer would be sent to him. One day it was the turn of a pregnant doe and the Bodhisattva’s heart melted and he offered himself to the King in her stead which so impressed the King that he not only decided not to kill any more deer but also gave them the park to roam freely. The inscriptions of early medieval period found at Sarnath reveal that the place was also called Dharmachakra or Sadhamachakra Pravartana Vihar. The current name Sarnath is a shortened version of Saranganath meaning ‘Lord of Deer’. In the 13th century Sarnath lost its glory and sunk into oblivion but regained it back in 1798.Many excavations were carried out by renowned archaeologists thereafter at the site which unveiled carved railing pillars from Shunga Period (2nd to 1st century BC). Sarnath became a prominent centre of Buddhism during the Gupta reign. The place gave rise to the Sarnath school of Art which became a main centre of Gupta Art and which is known for its simplicity of forms, elegance and sublimity. The images of Buddha displayed in the Shakyasimha gallery and the standing figure of the abundantly ornamented Tara are some very good specimens of late Gupta sculptural art of the Sarnath school. During this period Sarnath became a centre of structural and artistic activities and several structures like Mulgandhakuti the chief shrine of the Buddha were erected during this period. The Chinese monk and traveller Fa Hien visited Sarnath at the time of Chandragupta ll (376-414 AD) and saw four Stupas and two monasteries there. Later in the 7th century Hsuan Tsang left vivid descriptions of Sarnath’s monuments and stated that he found 30 monasteries and 3000 monks living there. During the reign of the Pala Kings, Sarnath continued to blossom. The last monastery built by Kumar Devi, wife of Govind Chandra (1114-1154 AD) of the Gahadavala dynasty was the last remarkable monument at Sarnath that got shape. Then invasion by Muslim armies and Turks caused a lot of destruction. After that the artistic and architectural activities came to a standstill till excavations by archaeologists unveiled again the glory and splendour of Sarnath. After Buddha attained Nirvana or enlightenment at Bodh Gaya in present day Bihar he gave his first Sermon or the Wheel of Dharma to the five monks who had accompanied him on his quest namely Kondanna, Bhaddiya, Vappa, Mahanama and Assaji who later on became his disciples. Thus Sarnath was the place where the foundation for a new order of monks called the Sangha and the Dhamma teachings were laid. Buddha’s first discourse delivered here is known in Pali as Dhammacakkhapavathana Sutta. The Anattalakhana Sutta and the Saccavibhanga Sutta are the other Suttas included. After his enlightenment Buddha’s central teaching centered around the Four Noble Truths concerning the meaning of life and the Noble Eightfold Path concerning the right way to live. The Sangha slowly grew to 60 in number and the Buddha sent the monks out to teach the Dhamma to others. 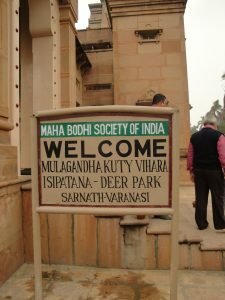 With the support of Kings and wealthy patrons Buddhism flourished in Sarnath. The first monument one encounters when entering Sarnath is the Chaukhandi Stupa. It is said to be the place where Buddha first met his five companions at Sarnath. During the Gupta period it was said to have been built as a terraced temple in the 4th to 6th century. It is a brick structure crowned with an octagonal tower. Hsuan Tsang in his records states that this was the tallest Stupa in the region at that time. It is the place where Buddha delivered his first discourse on Dhamma. It is a solid cylindrical brick structure 43.6m high and 28m in diameter. It was during Ashoka’s time in 249 BCE that the original foundation of the Stupa is said to have been laid. It was rebuilt in the 5th century and many additions and modifications have been carried out from time to time. From the site of the Dhameka Stupa an inscription from the period 1026 CE recovered shows that the structure was known as Dharma Chakra Stupa which over the years changed to its present name. There are eight niches in the Stupa which may have contained images of the Buddha. Just below the niches there is a broad strip that has beautifully carved designs like flowers, animals, humans, leaves, geometrical patterns, Swastikas etc. A short distance from the Dhameka Stupa are the ruins of the Dharmarajika Stupa. According to archaeologists it was said to be constructed during Ashoka’s reign and it contained the bones of the Buddha. It was said to have been destroyed and a casket of bones and gems recovered from the place was pilfered with only the casket remaining behind which is presently displayed at the Indian Museum Kolkata. The ruins of this Vihara can be seen near the site of the Dhameka Stupa indicating that a number of Buddhist monks lived in the monasteries in ancient times. Amidst the ruins a fenced in structure that resembles broken cylinders with inscriptions on them can be seen. These are the remains of the Ashoka pillar one of the most important structures at Sarnath. Emperor Ashoka is said to have built a series of pillars throughout India (covering present day Pakistan and Afghanistan) and the Sarnath Pillar is said to have been the grandest of all. In its original form the Sarnath pillar had a height of 12.25m with a diameter of 0.71m at the base and 0.56m at the top with a Lion Capital placed at the top with four back to back lions. The famous Ashoka Chakra topped this structure. During excavations fragments of the Ashoka Chakra were found around the Ashoka pillar after Turk invasions. The Ashoka Lion Capital is exhibited at the Sarnath Archaeological museum and the wheel fragments have been mounted on the walls of the museum. It comprises of five galleries with two verandahs. The museum houses a number of artifacts related to Buddhist Art including images and sculptures of Hindu Gods recovered during excavations. These include a life sized image of a standing Bodhisattva, a panel depicting Shiva slaying Andhakasura and the Lion Capital. Inside the Sarnath museum photography is not allowed. The Museum is open from 10 am to 5 pm and closed on Fridays. It is one of the most famous Buddhist temples in Sarnath built by the Sri Lankan Mahabodhi Society in 1931. It houses Buddha’s relics found in Takshila which are displayed every year on Karthik Purnima. There are beautiful frescoes on the walls of this temple depicting the life of the Buddha made by a Japanese artist. The Bodhi tree of Sarnath was planted from a branch taken from the Shri Mahabodhi tree of Shri Lanka and was planted by the founder of the Mahabodhi Society of India. The other notable Buddhist temples in Sarnath are the Nichigai Suzan Horinji temple, the Migadawun Myanmar temple and the Thai temple. As a result of Indo Thai joint effort recently a magnificent statue of Buddha has been built in the standing position at the Thai Buddha Vihar. This standing Buddha statue has a height of 80 ft and is said to be the tallest of its kind. To facilitate the arrival and departure of pilgrims from all over the world the Government has built a Modern reception Centre opposite to the Sarnath Museum with all public amenities like restaurant, money changer, food plaza, ATM, souvenir shop, book shop, guides, general shops, A/C retiring rooms etc all under one roof. The best time to visit Sarnath is between October and March. This is the winter period when the weather is cold and pleasant. The summer season could have very high temperatures and the rainy season could have heavy rains so may not be conducive for travel. 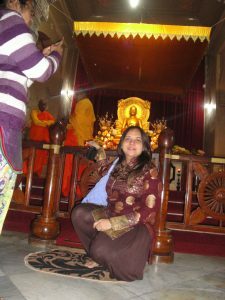 Sarnath is located in Varanasi, which is well connected with the rest of the country by road, rail and air. The best way of reaching Sarnath would be through Varanasi which is approximately 10Kms by road. One of the important domestic airports of India is Varanasi from where you can reach Sarnath. Almost all public and private airlines operate flights on regular basis to Varanasi linking it to cities like Mumbai, Khajuraho, Chennai and Delhi. Varanasi can also be reached from Kathmandu. The nearest airport from Sarnath is the Lal Bahadur Shastri Airport at Babatpur (Varanasi). Sarnath stands approximately 27Kms from this airport. Varanasi, being an important tourist destination, is well linked to other cities in India. A number of Government owned buses connect Sarnath to the adjoining cities. Many cities of Uttar Pradesh like Allahabad, Mathura, Agra, Lucknow, Kanpur etc have Private A/C and non A/C deluxe buses running on Varanasi route. A small railway station connecting Sarnath to Gorakhpur and Varanasi is located in Sarnath. Varanasi Junction is the major railway station, which is situated 10 Kms away from the place. Varanasi Junction railway station is linked to all major cities of the country via trains. If you are residing in a hotel in Varanasi you may easily board a taxi or auto on hire and travel to Sarnath in approximately half an hour to 1 hr. Though Sarnath is only 10Kms away from Varanasi the commuting time is slightly more due to the poor road conditions and traffic congestion though improvements are slowly taking place. Some also prefer to explore the route from Varanasi to Sarnath by auto Rickshaw. You may settle a price with the driver before the trip that may include the trip there, the waiting time and the trip back. In Sarnath you can go exploring the place in an auto rickshaw, taxi, bicycle, cycle rickshaw or by walking.
. Forest Rest House, Sarnath.
. Mahabodhi Society Dharamshala, Sarnath. Sarnath is one of the most sacred places for the Buddhists as Buddha gave his first sermon there called the Wheel of Law. The Wheel symbolizes the world with its illusory nature which goes on and on in infinite cycles of birth and death because of ignorance, attachment and desires and practising the tenets of Buddhism can enable mankind to transcend suffering and attain Bliss and Enlightenment.